Bulk chemical storage and the storage of chemicals in drums pose an environmental threat when the chemicals are spilled or leak. Proper storage and containment of the chemicals is vital to ensuring the health of the surrounding environment. Federal and state regulations (OSHA, DOT, RCRA) regulations specifically describe requirements for chemical containment, secondary containment, labeling, placarding, and manifesting. None are illustrated above. Large quantities of chemicals can, when spilled, contaminate the soil, the surface and ground waters, damage or kill plant or animal life. 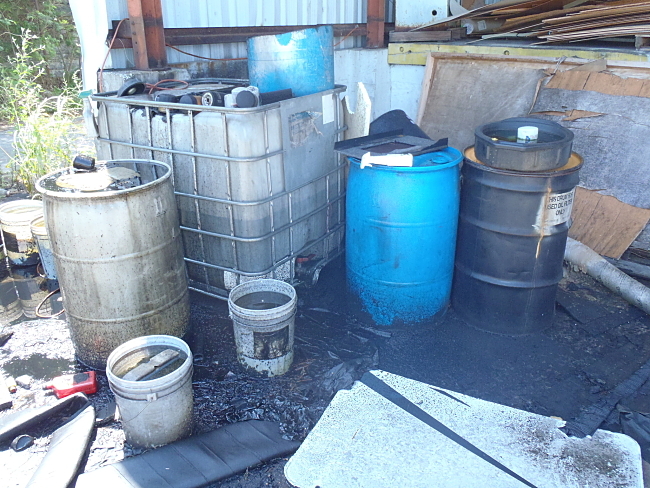 55 gallon drums are the most notable for the bulk storage of chemicals. Most of these drums are made of steel or aluminum; however some are made of plastics or other polymers. Storing the chemicals in an area that can contain the spills and regular inspection of the chemicals is vital to preventing environmental contamination. Without these containment systems in place the surface runoff from a leaking drum can get into streams and rivers and causes significant damage to the ecosystem. A leak from the drum can cause substantial harm to the groundwater as well and thus subsequently the drinking water in the area.